The Ryugyong Hotel is a towering, empty concrete shell that was once intended for use as a hotel in Pyongyang, North Korea. The hotel's name comes from one of the historic names for Pyongyang: Ryugyong, or "capital of willows". Its 105 stories rise to a height of 330 m (1,083 ft), and it boasts some 360,000 m² (3.9 million ft²) of floor space, making it the most prominent feature of the city's skyline and by far the largest structure in that country. If the building were ever completed it would be the world's tallest hotel, and the seventh largest building in the world. Today, however, it remains unfinished and uninhabited. 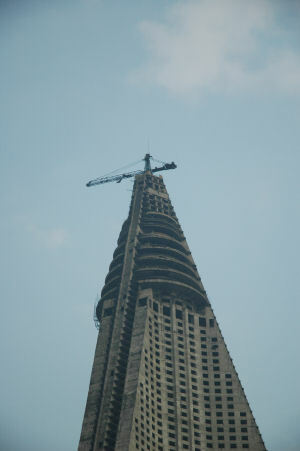 Construction on the pyramid-shaped hotel began in 1987. The reinforced concrete structure consists of three wings, the face of each wing measuring 100 m (328 ft) long and 18 m (59 ft) wide, which converge at a common point to form a pinnacle. At the top is a huge 40 m (131 ft) wide circular structure which contains eight rotating floors, topped by a further six static floors. A construction crane is perched at the top, and has assumed the role of a permanent fixture. The hotel is surrounded by a number of pavilions, gardens, and terraces. The building's plan for a 105-story height was reportedly a Cold War response to a South Korean company's completion of the Stamford Hotel in Singapore the previous year. North Korean leadership envisioned the project as a channel for Western investors to step into the marketplace. A firm, the Ryugyong Hotel Investment and Management Co., was established to attract a hoped for 230 million dollars in foreign investment. A representative for the North Korean government promised relaxed oversight, saying, “The foreign investors can even operate casinos, nightclubs or Japanese lounges if they want to.” It was added to maps and North Korean postage stamps before it was half-finished. 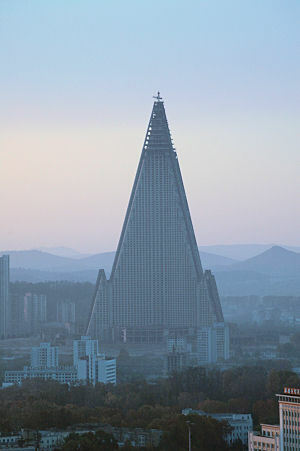 The Ryugyong's 3,000 rooms and seven revolving restaurants were to open in June 1989 for the World Festival of Youth and Students, but problems with building methods and materials delayed it. Japanese newspapers estimated the cost of construction was $750 million — 2% of North Korea's GDP — and it is generally assumed construction came to a halt in 1992 due to lack of funding, acute electricity shortages, and the prevailing famine. Official pictures of Pyongyang often show the building illuminated at night, but this is due to airbrushing. The basic structure is complete, but no windows, fixtures, or fittings have been installed, presumably due to the high cost. Experts say that the concrete used in building the hotel is of unsuitable quality and therefore unsafe; the building will never open as presently constructed. The North Korean government is trying to invite a foreign investment of $300 million to build a new structure for the hotel. In the meantime, it has removed the Ryugyong from maps and stamps and built a newer five-star hotel of more conventional design on the Taedong River. Info from Wikipedia. Thanks to Rob Williams, Vancouver, BC, Canada, for guiding me to the Ryugyong Hotel. Thanks to Will Kenney for the stunning pics.